Study the efficient and environmentally considerate system of food production - Aquaponics. Learn about aquaponics - an intensive form of farming where the two main elements - fish and plants - support each other. Understand the biology of plants and animals - the science of their nutrition and growth. Learn how to set up an aquaculture system, plant culture, and more. The course includes real life case studies, as well as a troubleshooting lesson where the student will study and learn about the outcomes to the main problems encountered in aquaponic systems. Learn about the culture of aquatic organisms with Aquaponics - an exciting blend of Hydroponics and Aquaculture. Special Offer - Reduced course price plus 6 free eBooks when you enrol. Aquaponics is the combination of hydroponics with aquaculture in controlled environment, whereby fish waste provides a source of nutrients for plants, and the plants, in turn, provide a filter for the water in which the fish live. Aquaponics is considered the world’s most productive food system with regards to water use efficiency. Many aquaponics systems only use around half of the volume of water to produce £100 worth of food (fish and vegetables or fruit) than inorganic hydroponics. Aquaponics is an intensive way of farming that can be conducted anywhere. It can produce a great deal more food products per unit of area than more traditional forms of farming. It diversifies the income for a grower, making them more resilient to fluctuations in income (e.g. when vegetables are in less demand, fish might be in higher demand. If fish profits drop, vegetable profits may increase). It can be viable on any scale, small scale set ups in small home garden can provide for the needs of a single family, while medium size operations on less than a quarter acre can be a viable small business, and large scale operations on many acres, even hundreds of acres can form the heart of a larger business enterprise. It can allow food to be produced closer to the end user in areas otherwise unsuited to farming (e.g. in a desert, in inland city areas, etc.). This reduces food miles, expenditure of fuel on food transport, reduces potential pollution, and in turn increases the freshness of food arriving at market. It can be more efficient use of water where water resources are limited. It can be environmentally friendly, containing and reusing waste, rather than returning it to the environment, and causing pollution. Can it be used with salt water. Types of Systems:constant flow closed reciprocating, open, deep water, floating raft. Barrel ponics, wick, NFT, etc. Advantages and disadvantages of aquaponics. Non recirculating (open loop systems or microponics). Components of commercial fish rearing systems. Intermittent flow (Ebb and flow). Solids removal: clarifiers, solids tanks, filters, screens. Sump and pH adjustment tank. Greenhouse houses and fish rearing facilities. Alarm and back up systems. Hydroponic grow beds and types of media. Maintenance, water monitoring and adjustment. Combining worms with growing beds. Plant structure: roots, stems, leaves, reproductive parts. Biochemical processes in a cell. Role of pH in plant growth. Bony fish (Osteichthyes) and their biology. Crustaceans: crabs, lobsters, shrimp and prawns. Water soluble chemical compounds: ions. How are chemical names written? What does a plant need. Variables in aquaponics: conductivity, ph control, oxygenation, beneficial bacteria in aquaponics. Overview of main species to grow: in Asia, South Africa, Australia, U.K., Europe, North America, South America. Other species: ornamental fish, crustaceans and molluscs. Which type of fish food to use: pellets, live food, daphnia, brine shrimp, tubifex worms, earthworms, oil meals. Fish food production: beef heartlegumes, seafood and vegetable mix. Earthworms: setting up, adding worms. Compost: understanding, making, conditions for compost production. Common pests and diseases in aquaponics. Choosing the right sized system. Greenhouses: passive systems, active systems. Relative humidity and vapour pressure deficit. Selecting media for aquaponic plant culture. Types of media Growing seedlings. Controlling plant growth: stopping, spacing, disbudding, trimming, training. Pest, disease and other crop problems: overview, identification. Pest, disease and disorder control in aquaponics. Harvest and post harvest management of fish. Harvest and post harvest management of vegetables and herbs. Harvested crop physiology: fruit ripening, respiration, when to harvest. How to prepare salad mixes from harvested vegetables: chlorine levels in water for washing produce, preventing bruising and rots, packaging. CA and MA storage Chilling damage and storage temperature. Case study: University of the Virgin Islands system. Case study: North Carolina State University system. Water imbalances; high levels of ammonia or nitrite. Controlling salinity and nutrients without damaging fish. Correcting nutrient problems in aquaponics. Fruit set management: pollination, floral initiation, fruit growth. Flower and fruit development problems. To ensure that a system is functioning at an optimal rate the water temperature, pH, dissolved oxygen, nutrients, salinity, ammonia and nitrite need to be within appropriate levels. Water temperature – this is vital to the survival of fish. Temperature fluctuations outside of the normal range for fish species can induce shock in fish and possibly lead to death. The climate of your region will influence the heating and cooling you will need. pH – measure of how acidic or basic the water is. The pH level is usually higher at the beginning of a cycle and then gradually decreases once a system has cycled completely. In general the pH should be between 6.8 and 7.2. Dissolved Oxygen – dissolved oxygen is required by all fish to survive. The water properties and stocking densities will affect its ability to hold oxygen. For example, warmer water will hold less oxygen. Nutrients – macro and micro nutrients are needed for healthy plant growth. Plants can grow with limited nutrients, however this will affect their appearance and flavour. They may also be more susceptible to disease without adequate nutrients. Salinity – non-iodized sea salt is used as macro nutrients and for treating any diseases in fish. Ammonia – this the first product of the nitrogen cycle. There are two forms of ammonia, unionized ammonia is most toxic to fish. Nitrite – this is the second product of the nitrogen cycle. Nitrite is produced by the oxidation of ammonia by bacteria and is highly toxic. 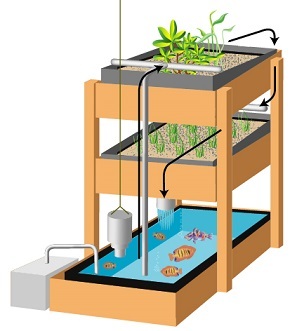 You can start the Aquaponics course at any time. ACS offer high quality courses, written and taught by experienced professionals. You can start our courses at any time, and with different study options (online or eLearning) you can choose when and where you want to study. Our principal John Mason, is author of one of the world's best selling hydroponic books. We have been teaching and collecting information on hydroponics since the early 1970's. Our tutors, include Dr Lyn Morgan - an internationally renowned expert on hydroponics, and a consultant who has worked across the world on commercial installations. Courses are continually improved – we invite feedback from all graduates and change courses immediately a need is identified. Courses are relevant to the whole world – we try hard to take a global perspective and make the learning transferable to any region or country. We receive many unsolicitied comments from students and graduates. A selection of these can be viewed on our student testimonials page. "I am loving the course! I have learned so much and can't stop reading the material. My tutors give me great feedback. I believe this has been one of the most rewarding and valuable learning experiences. Not only do I look forward to doing my classes everyday I'm also learning great information for something I am truly passionate about. I believe the layout of each lesson is very helpful and I am surprised how much information I learn from just reading a few pages. I graduated from an online national high school and was so happy when I found this school. I am very satisfied with this type of education. The school has been so helpful and nice! I am also very satisfied with the staff at this school. Anytime I have a question they have been right there to help me along the way. The support is great and it makes my learning experiences even better." Register to Study - Go to “It’s Easy to Enrol” box at the top of the page and you can enrol right now. We understand the importance of choosing the right course. If you have any questions, please use our FREE COUNSELLING SERVICE to contact a Hydroponics tutor - they will be more than happy to advise you. AIH is listed as a Preferred Member Training Provider; the Principal, John Mason, is a fellow of AIH. Aquaponics eBook The Aquaponics ebook will give you a great understanding of how to start your own aquaponics production. This 65 page ebook provides you with enough information to start your own home production and even manage issues as they arise. This is a great way to become more self-sufficient and produce a sustainable food source for your own household. Aquaponic farming allows individual families to grow a much wider range of produce, in a much smaller space. They can provide the protein needed for their diet (from fish), as well as the vegetables and fruit they need. Aquaponic systems can be as small as a few cubic meters; or as large as many acres. They are an ideal way of improving productivity on a hobby farm; can be used by restaurants to produce the freshest produce on site, or established inside buildings, in big cities, for urban farming. Fish for Freshwater Aquaculture and Aquaponics Choosing the most suitable fish for any fish farm or aquaponics system is a very important decision. Some fish species are easier to grow, some are more profitable to grow, and some suit a particular approach to fish culture better than others. Whether operating on a large or small scale; making the right choice of fish type can be the most critical decision, and this is the book to help you make that decision. Suitable for amateurs and professionals, a great overview for students or anyone new to aquaculture; inspiring and revealing for farmers who are thinking of stocking a dam, through to home owners considering re-purposing a swimming pool.